A founding story of our statehood starring someone we can be proud of, both as Californians and Americans. Even after 166 uneasy years in the American empire, the state of California doesn’t have a pithy origin story it can share with other states in an elevator. Like too much else in California, the narrative of our statehood is sprawling and complicated; it’s usually vaguely explained as a product of the Mexican-American War and the Gold Rush and the collisions of people that ensued from those two events. That narrative leaves us too much on the periphery of the country, and of U.S. history. And it also leaves us without a hero who can tie the story of our statehood together; the closest thing we have is John C. Fremont, a U.S. senator and the 1856 Republican nominee for president, whose main talents were for insubordination and losing money. Fortunately, more recent scholarship suggests that California could cut through its obscure early history in a Shermanesque way. 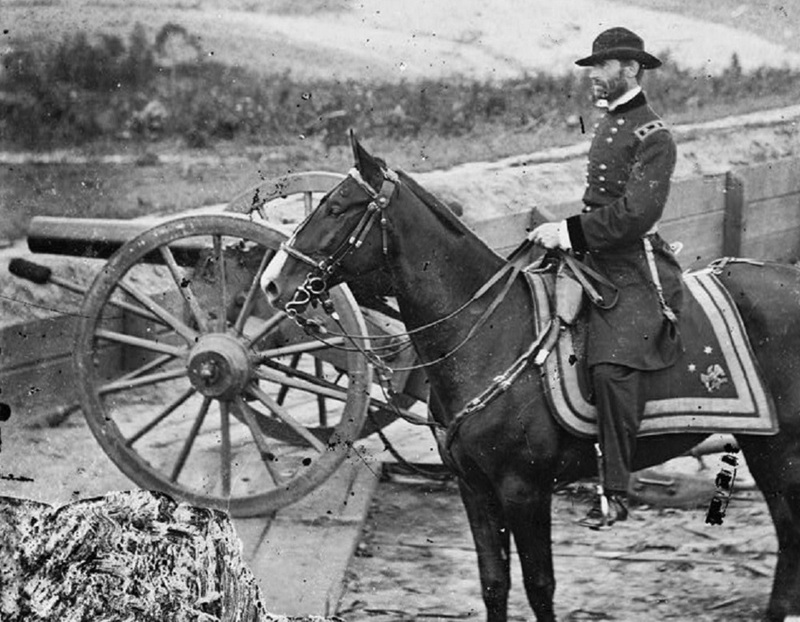 Yes, that’s right: William Tecumseh Sherman—the Civil War general best known for his decisive march through the South (and for refusing to run for president after the war despite his popularity)—offers Californians a compelling but overlooked protagonist in the tale of becoming a state, one who puts us closer to the center of American history. Unfortunately, Sherman’s military exploits have long overshadowed his earlier time in California—which was formative both for the state and for the man himself. Fortunately, a magisterial new biography from Auburn historian James Lee McDonough shows just how entwined Sherman was with California’s statehood prospects. In the process, McDonough demonstrates that California’s statehood should not be seen as a singular event but rather as part of the difficult and bloody rebirthing of the United States in the mid-19th century. As a Californian, Sherman would serve again and again as a stabilizing figure during great volatility—war, the Gold Rush, and financial and political crises. Originally from Ohio, Sherman arrived in California as a soldier in January 1847. He thought he would achieve military glory in the Mexican-American War, but, stationed in Monterey, he never saw action. Frustrated, Sherman threw himself into the civic life of the state. He met almost everyone of note, visited missions, unsuccessfully hunted grizzly bears, patronized the local arts, opened a store in Coloma (to supplement his meager Army wages), and spent as much time with the state’s women as possible. “Some of them are quite pretty, amiable, and have good minds which, if cultivated, would make them above the average,” he wrote, in McDonough’s account. Throughout his initial three-year stint in California, Sherman traveled widely. He was an early surveyor of the Sierra Nevada, and traveled by boat and on horseback between Northern California and Los Angeles, (where, he wrote, “the climate was so moderate that oranges, figs, pomegranates, etc. were generally to be found in every yard or inclosure.”). During the Gold Rush, he spent considerable time among the miners, reporting to the federal government on the gold and the people who were seeking it, tracking down soldiers who deserted to the fields, and getting to know John Sutter, who unsuccessfully sought the U.S. Army’s help in keeping gold prospectors from overrunning his lands. In 1849, Sherman was the U.S. military’s representative at the California convention, which produced the state’s first constitution. In 1850, California entered the Union as a free state, part of a famous compromise in the long run-up to the Civil War. That same year, Sherman went east to marry his Ohio sweetheart. By 1853, he had resigned from the Army and was back in San Francisco to establish a bank for the firm of Lucas, Turner & Co. There he became a significant figure in the growth and travails of California’s first great city, overseeing the construction of the bank at the corner of Montgomery and Jackson Streets, one of the rare buildings to later survive the great 1906 earthquake. Sherman’s conservative management of his growing bank made him an outlier in the wildly unregulated and corrupt financial sector of 1850s San Francisco. McDonough recounts—with new details—how Sherman’s care forestalled banking panic; in 1855, even as Wells Fargo and other banks closed during a bank run, Sherman’s bank stayed open and calmed the city. He did this all at personal cost. San Francisco was so expensive (some things don’t change) that even a banker couldn’t afford to live there; he went deeply into debt. His wife, not without reason, considered the city “thoroughly wicked” and begged him to leave. He suffered from terrible asthma that was aggravated by San Francisco’s wet weather. And he was bitterly criticized by the press in 1856 when he opposed the Committee of Vigilance that had lawlessly seized control of the city, banished some enemies, and hanged others. Sherman also formed a low opinion of the state’s democratically elected politicians. (Sherman preferred the company of women and his Army buddies). He particularly disdained Fremont; Sherman knew him through his California years as a military commander (who had declared himself military governor of California, only to be deposed), as a politician, and as a troubled businessman, and correctly judged him to be untrustworthy and self-destructive in all contexts. After another financial panic, Sherman would have to shut down his bank in 1858, though he was scrupulous, selling his own property so that depositors could be made whole. Having invested eight years and most of his money in California, he left the state that summer, but often would confess a desire to return (even in letters written at the height of the Civil War). California, McDonough shows, helped convince Sherman that humans needed a strong hand—and that authorities should deal forcefully with those who might step out of line. It would of course be the South that would feel the full force of Sherman’s conclusion. And after the war, Sherman would often argue for order and calm in the face of chaos (as after President Garfield’s 1881 assassination) by pointing to the panic, vigilantism, and greed he witnessed in the Golden State. Sherman became Sherman in California. And California became the state of California in his years there. After 166 years, isn’t it time we adopted a founding narrative that is more Shermanesque?